Length x Width Wisconsin is about 310 miles long and 260 miles wide. Explanation The geographic center of Wisconsin is located in Wood County, 9 miles SE of Marshfield. Borders Wisconsin is bordered by Minnesota and Michigan on the north and by Illinois on the south. On the east, Wisconsin is bordered by Lake Michigan. On the west, Wisconsin is bordered by Minnesota and Iowa. Total Area Wisconsin covers 65,503 square miles, making it the 23rd largest of the 50 states. Land Area 54,314 square miles of Wisconsin are land areas. Water Area 11,190 square miles of Wisconsin are covered by water. Highest Point The highest point in Wisconsin is Timms Hill at 1,951 feet above sea level. Lowest Point The lowest point in Wisconsin is Lake Michigan at 581 feet above sea level. Mean Elevation The Mean Elevation of the state of Wisconsin is 1,050 feet above sea level. Thousands of years ago, most of Wisconsin was visited by glaciers, scraping the tops off hills, leaving rich earth deposits and leaving a land of beautiful lakes (15,000 of them) resting in fertile plains and valleys arranged between rolling hills and ridges. This state can be divided into five geographical land areas; the Lake Superior Lowland, the Eastern Ridges and Lowlands (Great Lakes Plains), the Northern Highland, or Superior Upland, the Central Plain and the Western Upland. Lake Superior Lowland: In northern Wisconisin, the Lake Superior Lowland slopes gradually upwards toward the south from the shores of Lake Superior. This small area of flat plain extends about 5 to 20 miles inland. 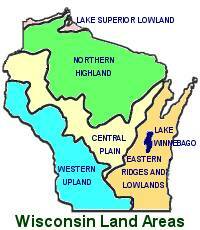 Northern Highland: Most of northern Wisconsin is characterized by Northern Highland geography. This area, lying south of the Lake Superior Lowland, expands into about 1/3 of the sate. The Norther Highland reaches its highest elevations in the north, sloping downward to the south. The Northern Highland supports hundreds of small lakes and heavily forested hills. Timms Hill, the highest point in Wisconsin, is located in the Northern Highland. Central Plain: South of the Northern Highland and curving across the central part of the state is an area of Central Plain. In the southern portion of the Central Plain, the Wisconsin River has carved the beautiful scenic gorge, Wisconsin Dells. This is an area of buttes and mesas; an unexpected landscape for central Wisconsin. Eastern Ridges and Lowlands: To the east of the Central Plain, the gently rolling hills of the Eastern Ridges and Lowlands area extends from Green Bay south to Illinios. This is the richest agricultural region of Wisconsin where ice-age glaciers deposited earth over limestone ridges. Western Upland: To the west of the Central Plain the Western Upland is characterized by limestone and sandstone bluffs along the Mississippi River. The Western Upland extends along the Mississippi River to the border of Illinios. The southwestern portion of the Western Upland was not touched by glaciers and is an area that supports steeply sloped ravines and winding ridges. Highest Temperature The highest temperature recorded in Wisconsin is 114°, Fahrenheit. This record high was recorded on July 13, 1936 at Wisconsin Dells. Lowest Temperature The lowest temperature in Wisconsin, -55°, was recorded on February 4, 1996 at Couderay. Average Temperature Monthly average temperatures range from a high of 82.8 degrees to a low of 5.4 degrees. Climate Average yearly precipitation for Wisconsin, from 1971 to 2000, is shown on this chart from Oregon State University. Benjamin D. Rhodes and Gary C. Meyer, "Wisconsin," World Book Online Americas Edition, http://www.worldbookonline.com/wbol/wbPage/na/ar/co/607320, August 15, 2001.